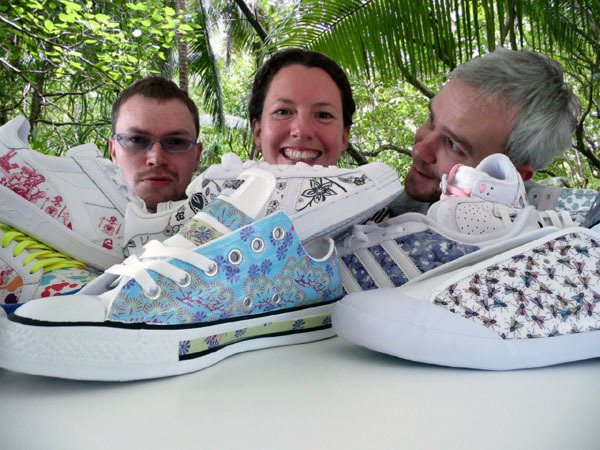 Zoe Gilbertson, co-founder of Sneakart, can change your sneakers forever. Or for a day. My husband is a footwear designer. 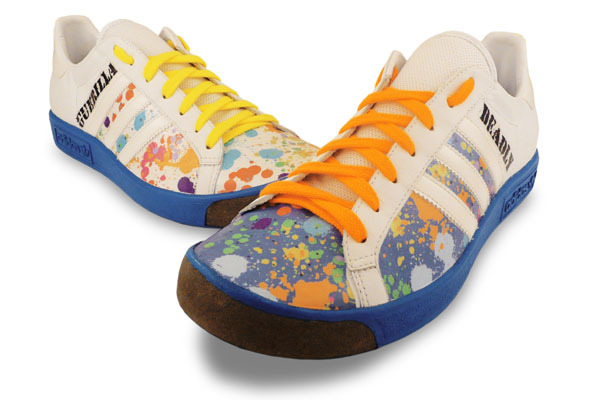 He’s worked for adidas and Puma and had the idea for sneakart a few years ago. He invented the sneakskin as a means for people to take sneaker design into their own hands. No offence to the big companies, but when you’ve worked there you know that the marketing people and design-team making the decisions about shoes are no different from you or me. In fact, often the customers are more forward thinking than the professionals. So he wanted to put the design into the customer’s hands in an easy and inexpensive way. 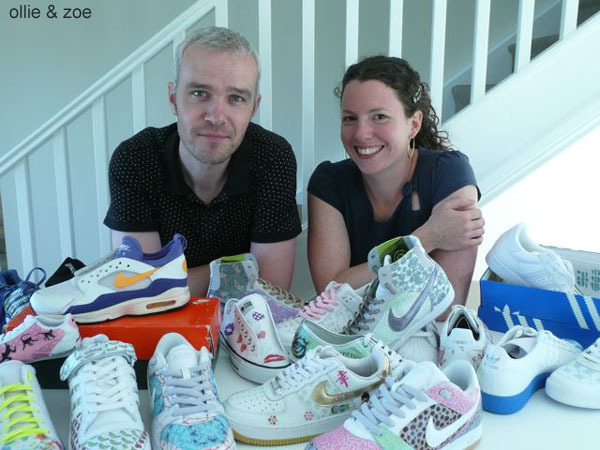 The process of setting up something similar to Nike ID would cost millions and the art and skill involved in traditional customising is very difficult for most people, so the idea of a sticker like ‘skin’ was born. What were some of the challenges you faced in creating this sneakskin? It took forever to develop the right kind of film, at least 2 years in development so loads of samples, test runs, tests with printers, wear tests on shoes, so many times when we thought it wasn’t going to work. We’re at the point where we are really happy with sneakskin, but we’re always working to make it even better. What background do you bring to starting a sneaker art company? I’m an apparel designer by profession. My first real job was as a designer at adidas in Germany where I worked on loads of interesting projects and traveled all over the world. After that I moved to Vancouver, BC to work at MEC, (an outdoor brand) as design manager. I’ve also done various freelance projects for other companies doing performance sportwear and some fashion stuff. I also know a lot about footwear because my husband and a lot of our friends are sneaker designers. Do you currently do other things besides run Sneakart? 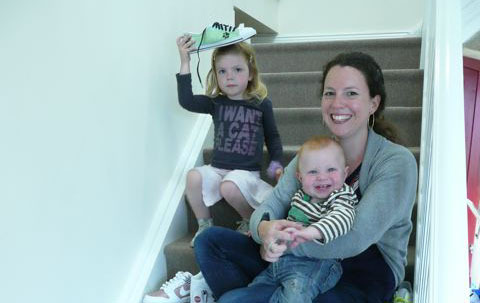 Ermm, I have 2 really young kids so that is my other job, I try and manage the 2 somehow – I make sure they have very nice shoes! My 4 year old has some white Chucks which are covered in sneakart stickers. What’s it like starting and running a company with your husband? It’s been good, we have a lot of ‘disagreements’ but we usually work them out through a lot of ‘discussion’. He is currently doing a lot of contract footwear design work, and I mainly run the sneakart side of things. We are both very busy but the way we work is quite flexible so it fits in well with having kids; we can work at the office and at home, and we discuss sneakart things whenever we get a spare moment. What is your specific role within the company, and what have you enjoyed about it? I’m the boss and I’m naturally bossy so I love it! There are 3 directors and I’m one of them. I run things on a day to day basis, decide creative direction, look after the website and marketing. Ollie tends to deal with production and technical issues to do with the film whilst continuing to design sneakers for brands; but we do decide all major stuff together. What’s been the hardest part of starting a company from scratch? You cannot fathom all the things you have to know about, it’s unbelievable. I’m learning something new every day. I come from a design background but I have to know about everything from marketing schemes to websites and finance. I like learning but I worry that I’m a bit crap at a lot of the non-creative number stuff. Figuring out all the web analytics is a real challenge! Have you found any particular challenges or perks to being a female in the sneaker industry? It’s still early days for me, so I can’t really say. I do know that the industry is dominated by men but that it’s harder for them to understand female taste. The more women there are designing for women, the better. I think you go far if you are a female and really good in this industry as there are not many about. I like a lot of male sneakers but I’d prefer a slightly sleeker shape and fit. 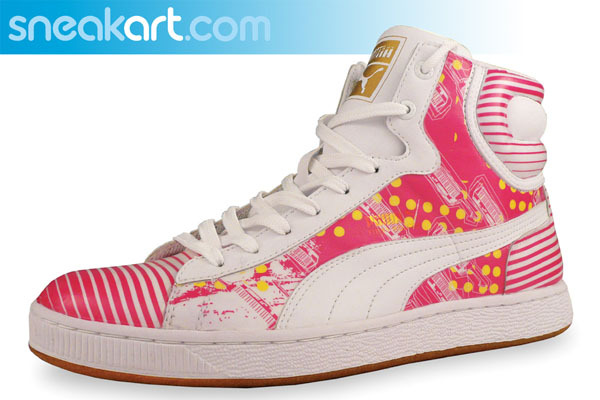 I don’t think shoes have to look typically girlie to appeal to women. We still have so much work to do in terms of improving the site, we also want to offer sneaker accessories, and maybe even think about doing a sneakart shoe, but that is way in the future. For now we’re still working on getting the word out and building on the good feedback we have so far. We also have big plans to grow the artwork library to involve a lot more urban artists and to line up some cool collaborations. Going back in time for a minute, can you remember the first kicks you loved as a kid? I think it was a red, Nike, nylon cortez running shoe with a waffle outsole. I was about ten, I think. I loved them because I was really into athletics and gymnastics and they made me fast! What’s your collection like now? I wouldn’t really consider myself a collector, but I do have a few pairs. 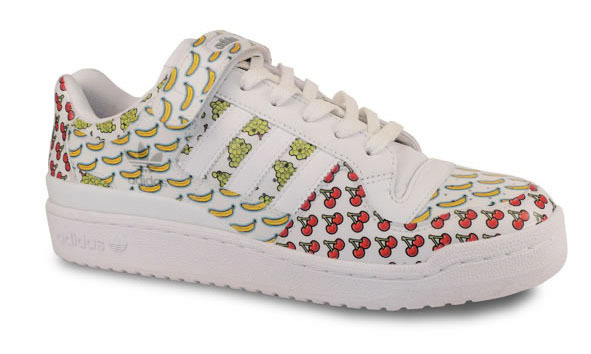 The most unusual shoes I have I suppose are some adidas samples that I picked up when I worked there. 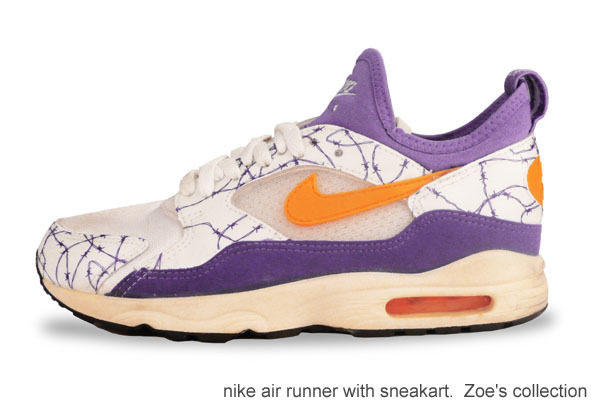 Also, I’ve got some pretty rare Air Max that are about 20 years old...I found these in a deadstock sale. 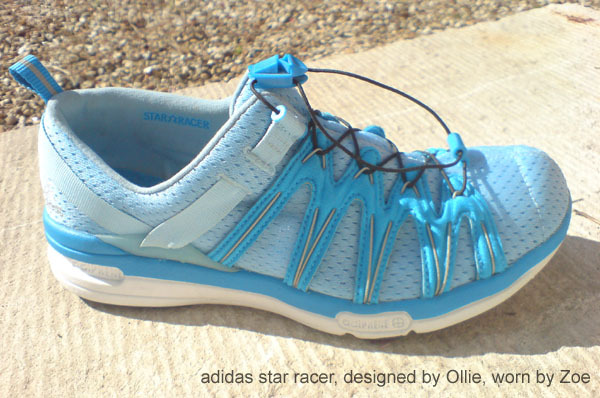 I also have some shoes that my husband Ollie designed! What do your kicks say about you? At the moment I wear blazers, which probably says that I’m a bit of a fashion victim! I’m also into adidas top ten Hi’s and I like the Liberty Dunks that are out at the moment. I did actually scan in some 70’s vintage Liberty fabric when we were first putting the sneakart library together, but decided we couldn’t do that because of copyright issues. Good job I didn’t because then those shoes came out and we would have been in trouble! What else do you want female sneaker fiends to know? Well, can I just give sneakart another plug?! I’d say just go for it and play around with sneakskin, if you follow the instructions you really can’t go wrong. It’s a lot of fun for very little money. And we’re just a nice group of people who love what we’re doing - not a big corporation but a tiny company trying to do something different.